We’d love your help. Let us know what’s wrong with this preview of The Hidden Village by Imogen Matthews. Wartime Holland. Who can you trust? Deep in the Veluwe woods lies a secret that frustrates the Germans. Convinced that Jews are hiding close by they can find no proof. The secret is Berkenhout, a purpose-built village of huts sheltering dozens of persecuted people. Young tearaway Jan roams the woods looking for adventure and fallen pilots. His dream comes true when he stumble Wartime Holland. Who can you trust? Young tearaway Jan roams the woods looking for adventure and fallen pilots. His dream comes true when he stumbles across an American airman, Donald C. McDonald. But keeping him hidden sets off a disastrous chain of events. Sofie, a Jewish Dutch girl, struggles to adapt to living in Berkenhout, away from her family and friends. As weeks turn to months, she’s worried they’ll abandon her altogether. Henk Hauer, head woodman, is in charge of building the underground huts and ensuring the Berkenhout inhabitants stay safe. But many grow suspicious of his liaisons with the Germans. Is he passing on secret information that could endanger lives? To ask other readers questions about The Hidden Village, please sign up. I was enjoying this book and becoming invested in the characters, then three quarters of the way through it started to peter out, and then suddenly it ended with a major event for which I was left with so many unanswered questions. Next thing, the story popped to twenty years later. It felt like the author lost interest and just wrapped it up with lots of loose ends. This is a compelling story about a village built by rebellious Dutch citizens to help hide their Jewish (or in other way dissident) neighbors and countrymen. Located deep in the Hoge Veluwe National Park, this village really did exist and several huts have been reconstructed in the original location. The author wrote her book after reading a non-fiction book about this village. However, her novel is not a rehashing of history, but a suspenseful and dramatic glimpse into the lives and inner though This is a compelling story about a village built by rebellious Dutch citizens to help hide their Jewish (or in other way dissident) neighbors and countrymen. Located deep in the Hoge Veluwe National Park, this village really did exist and several huts have been reconstructed in the original location. The author wrote her book after reading a non-fiction book about this village. However, her novel is not a rehashing of history, but a suspenseful and dramatic glimpse into the lives and inner thoughts of the villagers – both those being hidden and those helping them. The story takes us into their daily lives, scares, sicknesses, and ultimately their betrayal. It a well-written, moving story of courage, hope, and survival. My only criticism is that it ends quite abruptly. I would have liked to learn more about what happened to the characters after the war. Perhaps she’s leaving room for a sequel? A wonderful premise for a book and a story that definitely needs to be told : unfortunately though, as a story this book doesn't work well. The writing is poor and the characters under developed. Set in Holland during Hitler's reign of terror, this book is unlike any I have read before. I expected it to be similar to "The Diary of Anne Frank" in that the entire tale would take place indoors, however, I was thankfully wrong. Don't misunderstand me, I loved reading Anne Frank's diary, it's just that since then I have read numerous accounts of people in similar situations and I am ready for something different, something I have never heard about, or something completely new. I had never hea Set in Holland during Hitler's reign of terror, this book is unlike any I have read before. I expected it to be similar to "The Diary of Anne Frank" in that the entire tale would take place indoors, however, I was thankfully wrong. Don't misunderstand me, I loved reading Anne Frank's diary, it's just that since then I have read numerous accounts of people in similar situations and I am ready for something different, something I have never heard about, or something completely new. I had never heard of anything so daring as trying to hide an entire village full of people in a forest. It shocked me that THE HIDDEN VILLAGE was based on a true story. The author has done a great job of crafting a tale that centers on the people's lives, rather than on the war itself. Any violence portrayed in this story is there with a purpose - that of moving the story forward. I was greatly impressed by the narrator and his ability to create and maintain distinct voices for such a large number of characters. His pacing was perfect and he used inflection to create mood. I rate his performance as 5 out of 5 Stars. I highly recommend this story to anyone who loves not only historical fiction, but a great drama. I think that buying this book in audio book format is the best way to experience this tale. I received a free copy of this audiobook through AudioBookWorm Promotions, however, this is no way effected how I reviewed this book. An amazing story of survival. The people involved are so strong when they stood up to the Germans and they tried to help the Jews who lived among them as well as strangers who kept coming . What an excellent book! So good I couldn't put it down, as you can see I read it in a day. I didn't know anything about the Dutch hidden villages, so not only was the story page-turning but I learnt something new at the same time. The story revolves around characters in a Dutch village who help hide Jews from the German soldiers during WW2. From the first chapter you are engaged with the characters and I even found myself warning them when they were due to be raided - OUT LOUD! Sensitively writt What an excellent book! So good I couldn't put it down, as you can see I read it in a day. I didn't know anything about the Dutch hidden villages, so not only was the story page-turning but I learnt something new at the same time. I've read many historical fiction works and I must say that this is not my favorite. However, I would recommend reading it. The subject matter is unusual and the characters (underdeveloped) were interesting in their bravery and selflessness. I'm glad to know that there actually was such a place for all the helpless people and to learn once again how much suffering was endured by many nations. Definitely recommend reading this book. A story of survival during WWII of Jews, many separated from there families, and taken in and hidden by the town's peoples. Every well written. Excellent plot and wonderfully written! Much more of a story than I anticipated . I was amazed by how many of the Dutch fought the Nazis in their own way. They were willing to make sacrifices for other people at the expense of their own daily needs. This book held my interest from page one. I had no idea that people hid out in the forest from the Germans in these huts during WW II. Fascinating. I was really happy with the ending. Meh. Just okay for me. Felt like I was reading something for a high school kid. The dialogue and writing was very elementary then I got bored. Never finished it. Couldn't put this book down. Have read a few historical fictions about WWII but this one was the best. I was transported through time and space and felt as if I was right there. This is a powerful, inspiring, heart breaking audiobook that you can't stop listening to. It is fiction but is loosely based on the hidden villages in Holland during the war - it was something that I had never learned about and encouraged me to learn more. Based in WWII, it follows the kindness and bravery of a group of people determine to protect those persecuted from the Germans. They create their own little hidden Village deep in the woods, far from the German's eyes but not so far that they can live like a normal village. The people take great risks to not only get the individuals to the Village but to get them supplies, food and ensuring that no one else finds out about the group. It is an inspiring story about the bravery and kindness of ordinary people who did everything they could during the war. It had me in tears at times at the unfairness and other times smiling at the ability of the children to still find the good points in their lives. The children take on such a key role during this time both protecting the people and communicating messages, this can also be a downfall due to their innocence and excitement. The narration in this story is excellent. He manages to somehow capture the innocence and trust of a child - he captures their inability to grasp the complete nature of the seriousness of their situation and how they sometimes only see the unfairness (like when Sofie was mad at her friend for being able to move freely while she was stuck in hiding - she knew it was important to be in hiding but she still felt it was unfair and not right). You felt the urgency in his tone and in the situation when the Germans would come to the homes and it kept you on your seats. He kept the story engaged with his tone and I loved listening to him telling the story. This was a powerful audiobook - you were constantly on the edge of your seat as the village grows and the uncertainty of their situation increases. You were in constant fear that they would be found and your stomach turns every time they come in contact with a soldier. This is a definite must listen to for both young adults and adults alike. Absolutely loved this historical fiction. Definitely tugged at your heart strings and told a fantastic story I would definitely recommend it and read it again. It was fascinating to read a book based on true events during WWII that I had never heard about. The fact that this village, that had been built in the forests to hide Jews for over 2 years, was a miracle for those hiding from the Nazis. It brought together people from all over Holland and showed how they worked together with those in the nearby village to be able to survive the horrors that faced them if they were caught and sent to the concentration camps. The story of the lives of the survivors and how their lives were intertwined was so fascinating even though the story was fictional but was based on facts. The bavery and willingness for individuals to sacrifice so much for the good of some they never knew shows the best of what humans can give to one another. 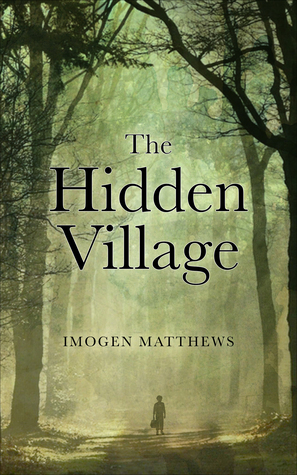 The Hidden Village by Imogen Matthews. This is a fictitious account of a hidden village that was actually created in Veluwe, a national park in Holland. During World War 11, a group of Jews hid from the Germans by living in underground huts in this village. They were helped by a group of men and women and children in the nearby village. This group of rescuers gathered food and other necessities for the hundreds of people who eventually lived in this hidden village. Imogen Matthews used archive m The Hidden Village by Imogen Matthews. This is a fictitious account of a hidden village that was actually created in Veluwe, a national park in Holland. During World War 11, a group of Jews hid from the Germans by living in underground huts in this village. They were helped by a group of men and women and children in the nearby village. This group of rescuers gathered food and other necessities for the hundreds of people who eventually lived in this hidden village. Imogen Matthews used archive materials, letters, photos, interviews, and a book called ‘Het Verscholen Dorp’ by A. Visser which was an account of this village. She also used this book as a way of writing down the stories her own mother told of the years spent in Holland during its occupation by the Germans. The result is a very unique look at this hidden village and the people who lived there and helped hide them. The story revolves around a Holland youth, Jan, and a Jewish girl, Sofie, along with her best friend Liesbeth, a Holland girl. Sofie was in school with Jan’s brother Oscar and her best friend Liesbeth. Sofie had a crush on Oscar and he had one on her. Liesbeth, who was more outgoing than Sofie, encouraged her to get to know Oscar better. Shortly after this, Sofie’s world collapsed when she was forced into hiding because she was Jewish. She was among the first to go to live n Berkenhout woods and the last to leave. Oscar had helped build the huts they were to live in and then was sent elsewhere to help. Liesbeth worked with the underground to get food for the Jews and helped keep Sofie’s spirits up as she was separated from her parents. Jan, Oscar’s little brother, ached to help but was continually thwarted from helping by his own father. Jan didn’t understand that his father was trying to protect him. However, a ten-year-old boy finds a way to get into trouble. The book is quite interesting and well-written. Knowing that Berkenhout did indeed exist as did the majority of the characters makes it even more interesting. It makes you wonder how many places like this existed throughout Europe and remain unknown to this day. Care and compassion of fellow human people. This is a wonderful story about WW2. When the German' s took over Holland. The story go on to tell how the Kampenveld community worked together to save many many Jewish people of their village and Jewish people all over Holland. First they built a hidden village in the middle of the forest. The hidden village was called Berkenhoust. It consisted of huts built underground and some above ground. The people of Kampenveld supplied Berenhoust with food and s Care and compassion of fellow human people. This is a wonderful story about WW2. When the German' s took over Holland. The story go on to tell how the Kampenveld community worked together to save many many Jewish people of their village and Jewish people all over Holland. First they built a hidden village in the middle of the forest. The hidden village was called Berkenhoust. It consisted of huts built underground and some above ground. The people of Kampenveld supplied Berenhoust with food and some medical supplies. These people of Kampenvald helped save many Jewish people from being set to concentration camps or worse. The love and compassion of these people is inspiring. I really enjoyed reading this book. It was a good story and I felt like I was there in Holland with all the characters in the book. I wish the book gave more details of what Jan felt visiting Ohio and also his mother seeing the American in Ohio. That could me a story in itself. Also, what happened to his brother Oscar and also what happened to the father. I would recommend this book to a friend. What an enjoyable book to read, even with the heartfelt story it captured. It is well written and keeps the reader engaged. The author did a wonderful job of projecting the characters onto the backdrop of a real story set so that the reader could feel what it might have been like living hidden for years. It is well worth the time taken to read this tale of how people lived during such an awful time. I have read many books on WW2. I knew the Germans were in Holland but I didn't know about the hidden villages. There were so many wonderful human beings that gave their all for others. It would have been nice to know what happened to the other characters. Amazing historical fiction. This story needs to be told least we forget. Well developed characters that interact with each other to do the right thing to protect those targeted by the Nazis. It was wonderful to find out about The Hidden Village as I'd never heard of it before. It's another incredible WW2 story of Nazi resistance by ordinary people at great personal risk. I thoroughly enjoyed the book and the characters within. Good storyline, believable and a good ending. I also learned a lot of history about the war that I never knew before. Imogen Matthews lives in Oxford, England, and is the author of two romantic fiction novels. The Hidden Village is her first foray into historical fiction and YA. She was born in Holland to a Dutch mother and English father and moved to England when she was still a baby. Imogen has always enjoyed holidays in Holland and since 1990, has gone regularly with her husband and two children to Nunspeet on Imogen Matthews lives in Oxford, England, and is the author of two romantic fiction novels. The Hidden Village is her first foray into historical fiction and YA. Imogen has always enjoyed holidays in Holland and since 1990, has gone regularly with her husband and two children to Nunspeet on the edge of the Veluwe woods.